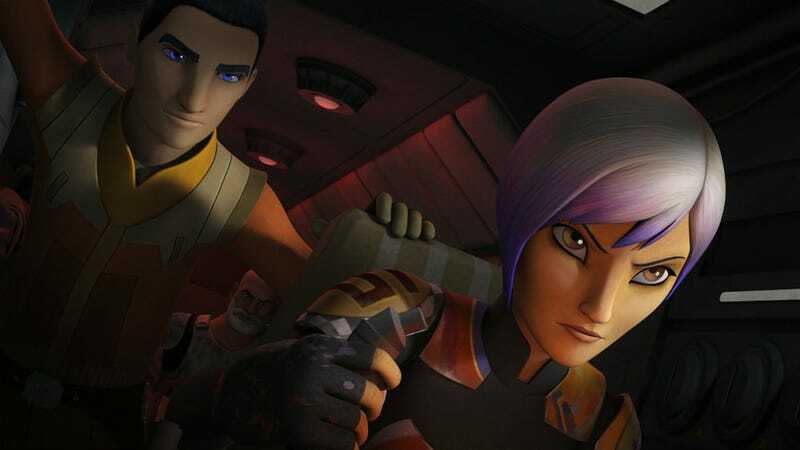 For the past two seasons, Rebels has been like almost every other Star Wars story: a young person trying to learn the Force, an older mentor, a group of good guys fighting an evil regime, and bad guys with red lightsabers. With season three, though, executive producer Dave Filoni is trying something different—and in doing so, he’s begun to complete the circle. This is the reason Filoni decided to introduce Grand Admiral Thrawn into the series. The fan-favorite character is a master military strategist who provides a threat unique to all of Star Wars to date; he’s a servant of the Emperor with no personal agenda other than crushing the Rebels to secure the safety of the Galactic Empire. The addition of Thrawn doesn’t mean everything is different, though. At its core, Rebels will still be about that younger Jedi-in-training, Ezra Bridger, and his older mentor, Kanan Jarrus. But Filoni also wanted to change that relationship from what we’ve seen in the past. Much of that will derive from where season two left the characters, with Ezra having discovered the power of the Dark Side, Kanan having lost his sight, Ahsoka missing, and Darth Maul now in the picture. Maul also won’t be the only recognizable character on the show this season. Though Filoni admits it’s a bit trickier to add in original trilogy characters to the show the closer things get to Rogue One and A New Hope, there are some to whom they feel beholden. Princess Leia appeared on Rebels season two. Maybe she’ll be back. “Between Empire and Jedi, [Luke and Leia] are already in the act of saving Han. Luke knows he’s going to have to confront the Emperor. There’s a period there where they’re making some very serious decisions about what they’re going to do next and a lot of that is not just because they’ve come in contact with the greatest powers of the galaxy but they have some of the great power of the galaxy. We’re in a similar situation where Ezra has come in contact with Darth Vader, he’s been a part of defeating Inquisitors, and he’s seen what evil power can do. The third season of Star Wars Rebels premieres September 24.
Who Is Grand Admiral Thrawn and Why Is His Appearance in Star Wars Rebels So Exciting?